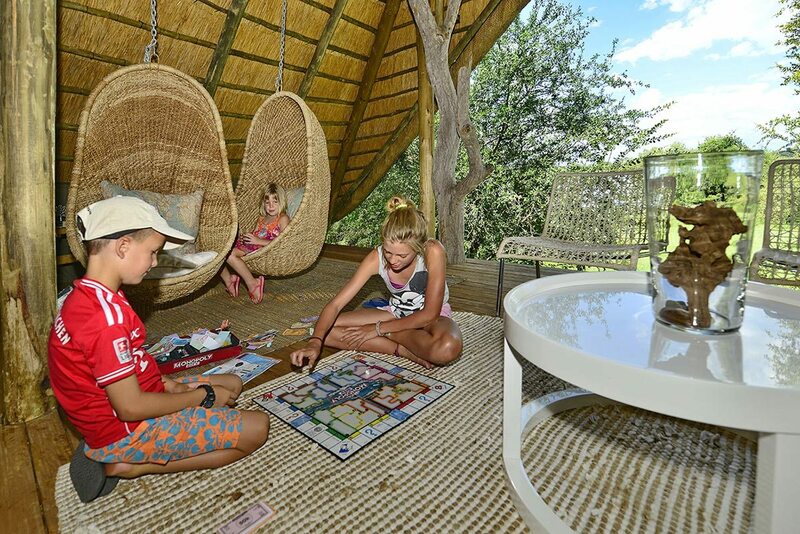 Thoughtfully-designed family suites give a lodge-within-a-lodge feel to this luxury family safari in Botswana and Zimbabwe, allowing kids to be themselves without worrying about bothering other guests. 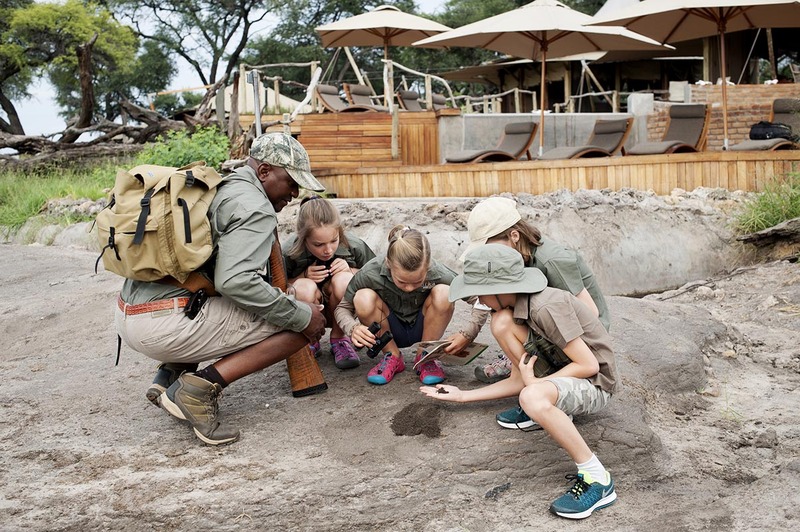 Children’s activities give parents a welcome break, while private safaris let the whole family reconnect and make special memories together in remote, wild places. 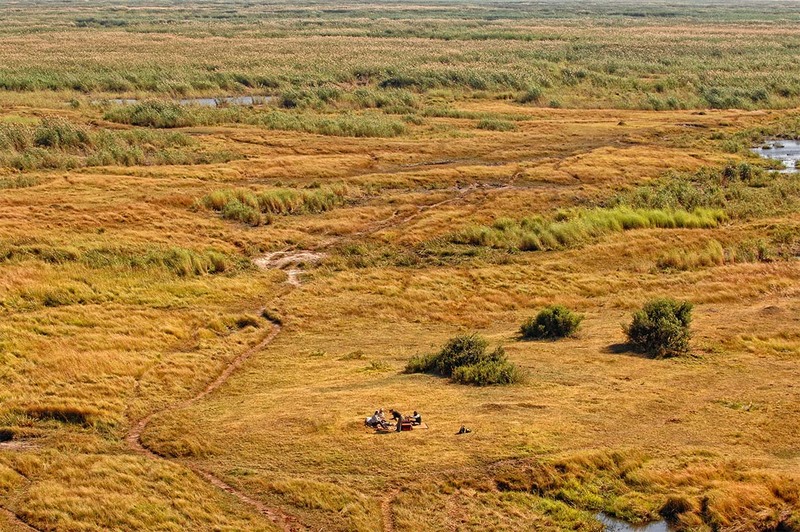 A patchwork quilt of floodplains, lagoons and woodlands in Botswana’s Linyanti, savannah grasslands studded with statuesque dead trees in Hwange and a wall of spray and sound at Victoria Falls. 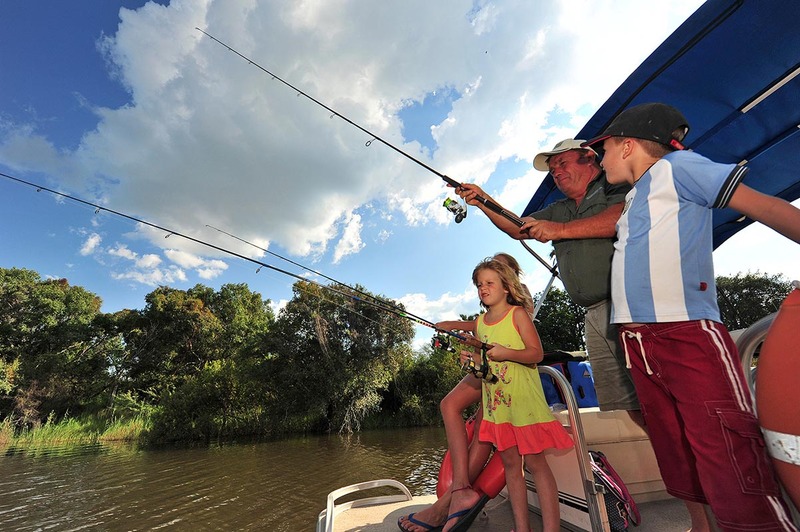 Lots of scope for quality family time, whether lagoon-hopping in Linyanti, seeing big herds in Hwange, cruising the Zambezi at sunset, microlighting over Victoria Falls, going on safari beside the Zambezi or canoeing along it. 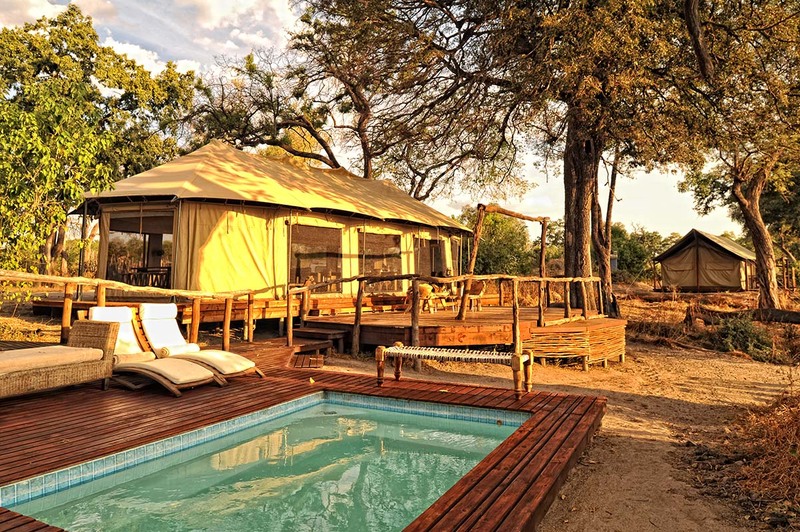 Two-bedroomed family tents at Linyanti Ebony and Somalisa Acacia (sleeping four), and a tented family suite at Victoria Falls River Lodge with an adjoining children’s room (sleeping two adults and three children). 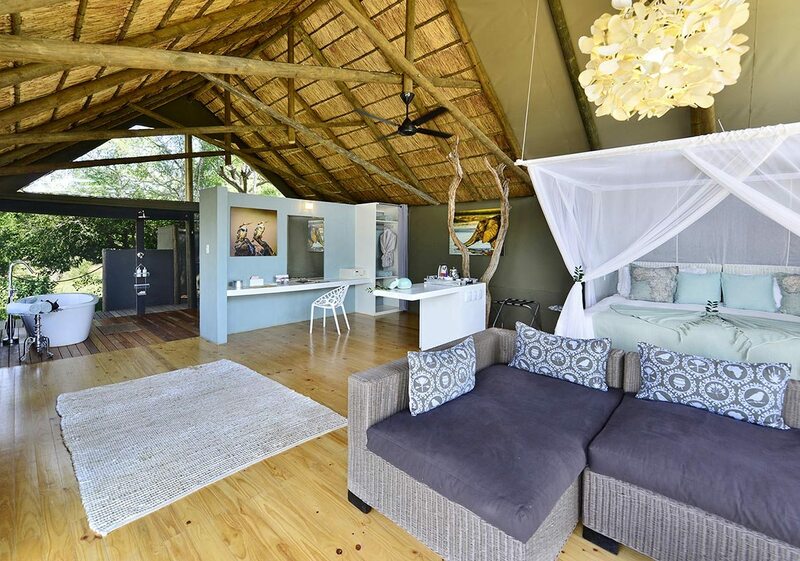 For more information see the family tent at Linyanti Ebony, family tent at Somalisa Acacia and Victoria Falls River Lodge. The giant trees standing proudly above the family tent at Linyanti Ebony seemed to have inspired our growing nine-year old. His brief disappointment at being told that he wasn’t allowed to climb them disappeared at the prospect of an afternoon’s lagoon hopping. Not a new playground game, but a fascinating tour of some of the bodies of water along the line of the Linyanti River. Our daughter was intrigued to be so close to an international border (with Namibia) without needing her passport; our son got a huge kick out of watching hippo appear to surf through the shallows.Our kids were a little too young to join us on a walking safari, so we agreed to take separate paths for the morning and meet up again later to compare notes. One guide took them on a shorter walk, staying closer to the lodge, while we headed slightly further afield. Our highlight was seeing fresh wild dog tracks, heading back towards the lodge. Back at the main area, wide eyes and wider smiles told the story of the kids’ morning – the pack of wild dog, with youngsters, had dashed by, just 100m from them. They were thrilled by their puppy patrol.Fresh air and novel experiences had taken their toll, and we let sleepy heads lie-in before a leisurely brunch on our third day. We had big plans for later, so spent a chilled day in our family tent, with another short walk yielding treasures like guinea fowl feathers and porcupine quills. Bundled up in blankets and with a flask of hot chocolate, our night drive promised to be a real adventure. Both youngsters stayed awake long enough for a rare but wonderful sighting of an aardvark, or ‘long-nosed dwarf pig’ as it was instantly renamed. A chorus of frogs welcomed us home – those of us not already asleep. The giant trees standing proudly above the family tent at Linyanti Ebony seemed to have inspired our growing nine-year old. His brief disappointment at being told that he wasn’t allowed to climb them disappeared at the prospect of an afternoon’s lagoon hopping. Not a new playground game, but a fascinating tour of some of the bodies of water along the line of the Linyanti River. Our daughter was intrigued to be so close to an international border (with Namibia) without needing her passport; our son got a huge kick out of watching hippo appear to surf through the shallows. Our kids were a little too young to join us on a walking safari, so we agreed to take separate paths for the morning and meet up again later to compare notes. One guide took them on a shorter walk, staying closer to the lodge, while we headed slightly further afield. Our highlight was seeing fresh wild dog tracks, heading back towards the lodge. Back at the main area, wide eyes and wider smiles told the story of the kids’ morning – the pack of wild dog, with youngsters, had dashed by, just 100m from them. They were thrilled by their puppy patrol. Fresh air and novel experiences had taken their toll, and we let sleepy heads lie-in before a leisurely brunch on our third day. We had big plans for later, so spent a chilled day in our family tent, with another short walk yielding treasures like guinea fowl feathers and porcupine quills. Bundled up in blankets and with a flask of hot chocolate, our night drive promised to be a real adventure. Both youngsters stayed awake long enough for a rare but wonderful sighting of an aardvark, or ‘long-nosed dwarf pig’ as it was instantly renamed. A chorus of frogs welcomed us home – those of us not already asleep. A combination of light aircraft and road transfers (and another passport stamp for our delighted daughter) brought us to Zimbabwe’s legendary Hwange National Park, and gave us a chance to blend our small herd with the many creatures there.The afternoon heat necessitated a dip in the plunge pool and, gazing around us, we saw that we weren’t the only ones in search of water. Just in front of Somalisa Acacia, a small waterhole was doing a brisk trade. We had fun testing our kids to see how many of the animals from Linyanti they remembered, and they did really well – although a male kudu foxed them. We toasted the setting sun with G&Ts and ‘baby G&Ts’ made to look like the real thing. The stars came out as we headed in for a family dinner.Our guide clearly had an affinity for children of all ages, and alternately had them in stitches and gasping in wonder as he regaled them with bush tales on our game drive. And what a morning it was, watching a vast herd of buffalo parting a sea of golden grass, and two young male elephant tussle to see who was the strongest … a scene that was enthusiastically re-enacted by our son when we stopped for our picnic, with my partner sportingly losing the contest (and with it, the rights to the last chocolate-chip cookie). ‘Don’t worry, we’ll bake more,’ promised the chef.He was as good as his word, and our kids leapt at the chance to join him in the kitchen and make hippo-shaped biscuits, which they proudly presented to us at the end of a relaxed morning in our family tent. Sipping hot coffee, munching a biscuit made with love, and listening to my kids discuss how many cookies a real hippo could eat, I experienced yet another moment of complete happiness – and resolved that we’d have more family mornings like this when we returned home. There wasn’t a tablet or phone in sight, inboxes were forgotten, and we could simply be. 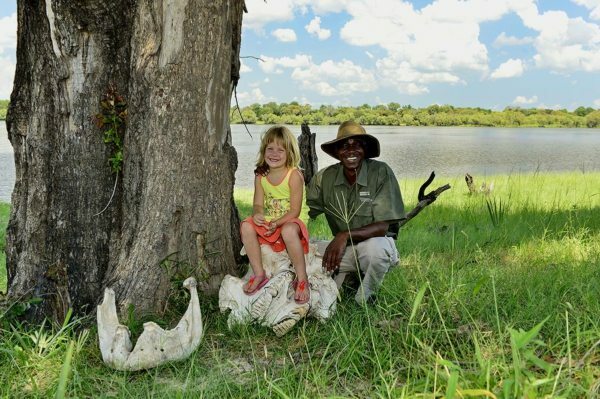 for our delighted daughter) brought us to Zimbabwe’s legendary Hwange National Park, and gave us a chance to blend our small herd with the many creatures there. The afternoon heat necessitated a dip in the plunge pool and, gazing around us, we saw that we weren’t the only ones in search of water. Just in front of Somalisa Acacia, a small waterhole was doing a brisk trade. We had fun testing our kids to see how many of the animals from Linyanti they remembered, and they did really well – although a male kudu foxed them. We toasted the setting sun with G&Ts and ‘baby G&Ts’ made to look like the real thing. The stars came out as we headed in for a family dinner. Our guide clearly had an affinity for children of all ages, and alternately had them in stitches and gasping in wonder as he regaled them with bush tales on our game drive. And what a morning it was, watching a vast herd of buffalo parting a sea of golden grass, and two young male elephant tussle to see who was the strongest … a scene that was enthusiastically re-enacted by our son when we stopped for our picnic, with my partner sportingly losing the contest (and with it, the rights to the last chocolate-chip cookie). ‘Don’t worry, we’ll bake more,’ promised the chef. He was as good as his word, and our kids leapt at the chance to join him in the kitchen and make hippo-shaped biscuits, which they proudly presented to us at the end of a relaxed morning in our family tent. Sipping hot coffee, munching a biscuit made with love, and listening to my kids discuss how many cookies a real hippo could eat, I experienced yet another moment of complete happiness – and resolved that we’d have more family mornings like this when we returned home. There wasn’t a tablet or phone in sight, inboxes were forgotten, and we could simply be. Although we didn’t cross any borders this time, our light-aircraft flight to Victoria Falls was one to remember, especially when the pilot circled close to the falls, giving us our first glimpse of them.On our first afternoon, we had a great chance to get up close and personal with the Zambezi River when we headed out for a sunset cruise. With binoculars and a hamper of snacks and drinks, we set off. Our captain was an expert in distinguishing hippo from boulders, and avoiding both. Crocodile lay, mouths open, on the bank, trying to catch a last few rays as the sun began to sink. We managed to keep straight faces as we got the kids to hush and listen for the sizzle of the sun as it sank into the water.The next day we took advantage of Victoria Falls River Lodge’s babysitting service so that we could explore the river under our own steam – or, rather, by paddle power. A canoe safari gave us the opportunity for a little exercise (especially when we tried to paddle against the current) and also to approach birds more quietly. We were rewarded with several bright flashes that were kingfishers, and then a species we’d never seen before: a finfoot. Pulling up onto a sandy island, our guide showed us crocodile tracks as we sipped coffee. 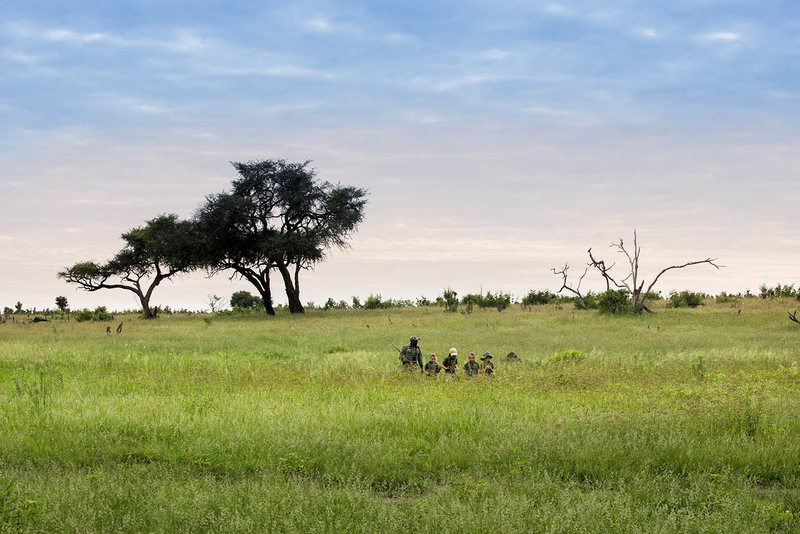 The hum of a microlight engine reached us, and gave me an idea…As our lodge was within Zambezi National Park, we combined a safari beside the Zambezi with my microlight flight. The 4×4 vehicle easily handled the muddy trails as searched for elephant along the banks, and then carried us in comfort through the town of Victoria Falls. Not long afterwards – while my partner and kids took pictures – I was seated behind the pilot of the microlight as we ascended. The views were phenomenal, and we flew low enough to wash the underneath of our craft – or so the pilot joked. Needless to say, it took a while to come back down to earth. Although we didn’t cross any borders this time, our light-aircraft flight to Victoria Falls was one to remember, especially when the pilot circled close to the falls, giving us our first glimpse of them. 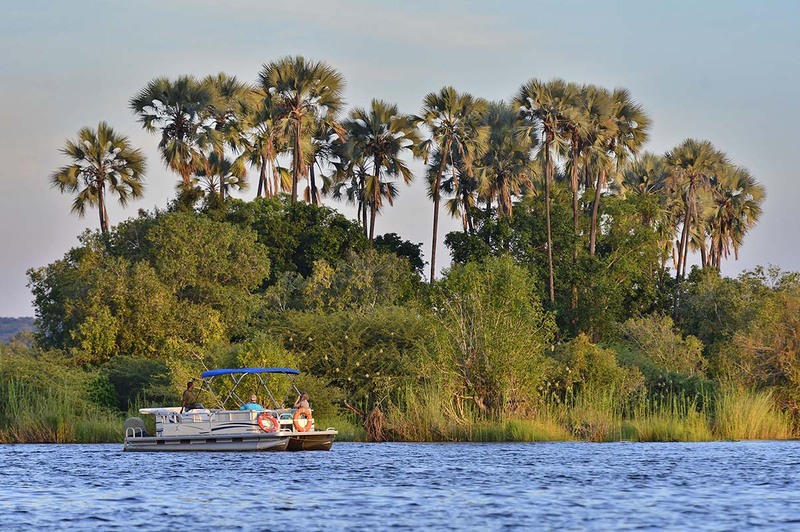 On our first afternoon, we had a great chance to get up close and personal with the Zambezi River when we headed out for a sunset cruise. With binoculars and a hamper of snacks and drinks, we set off. Our captain was an expert in distinguishing hippo from boulders, and avoiding both. Crocodile lay, mouths open, on the bank, trying to catch a last few rays as the sun began to sink. We managed to keep straight faces as we got the kids to hush and listen for the sizzle of the sun as it sank into the water. 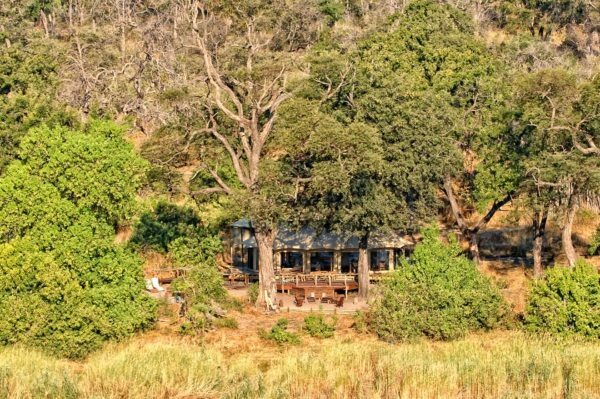 As our lodge was within Zambezi National Park, we combined a safari beside the Zambezi with my microlight flight. The 4×4 vehicle easily handled the muddy trails as searched for elephant along the banks, and then carried us in comfort through the town of Victoria Falls. Not long afterwards – while my partner and kids took pictures – I was seated behind the pilot of the microlight as we ascended. The views were phenomenal, and we flew low enough to wash the underneath of our craft – or so the pilot joked. Needless to say, it took a while to come back down to earth. 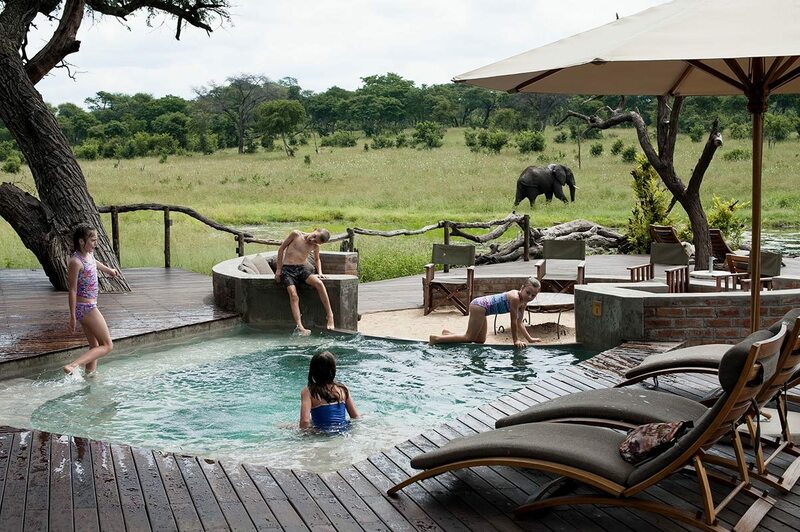 Our luxury family safari felt as though it had been designed with our needs (and those of our nine-year old and tween) in mind. Which, of course, it was. At each of the luxury lodges on our itinerary, we had our own family accommodation so our more raucous pillow fights and animal impressions wouldn’t disturb any of the other guests.As adults, we enjoyed the chance to share a sundowner with some of our fellow travellers, and babysitting services and the option of in-room, earlier dinners meant that our kids didn’t have to wait up to eat. 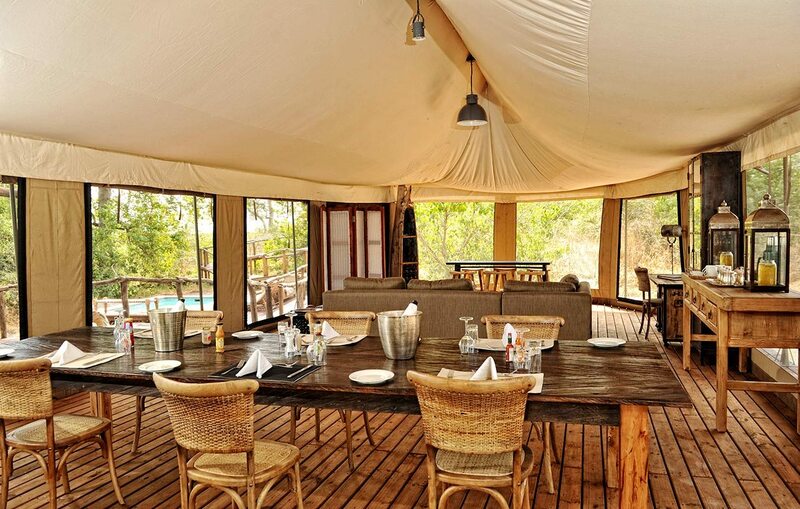 Meanwhile, we could occasionally join the other guests around the main table – or steal a couple of candlelit hours all to ourselves.Having booked private vehicles let us adjust the standard lodge hours – a bonus you’ll appreciate if you’ve ever had to introduce a pre-teen to the pre-dawn. We’d planned on shorter game drives, but each of our guides did such a good job of mixing entertainment and education that the hours simply flew by and the dreaded ‘are we there yet?’ was never uttered.Exploring pristine African landscapes with no signs of human life only added to the sense that this luxury safari in Botswana and Zimbabwe was all about us. Delightful as the lodges were, we came to realise that the true luxury in this trip was having the time and space to bond and create shared memories that will last far longer than this week’s high school crush or latest toy fad. 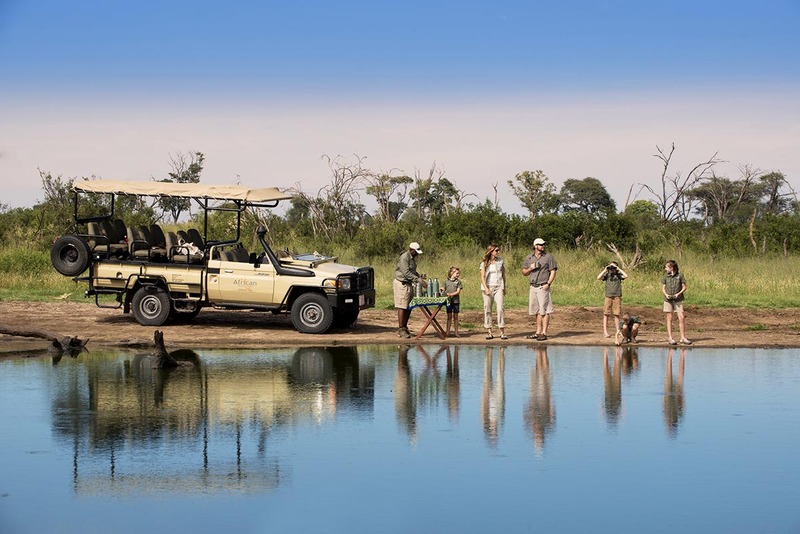 Our luxury family safari felt as though it had been designed with our needs (and those of our nine-year old and tween) in mind. Which, of course, it was. 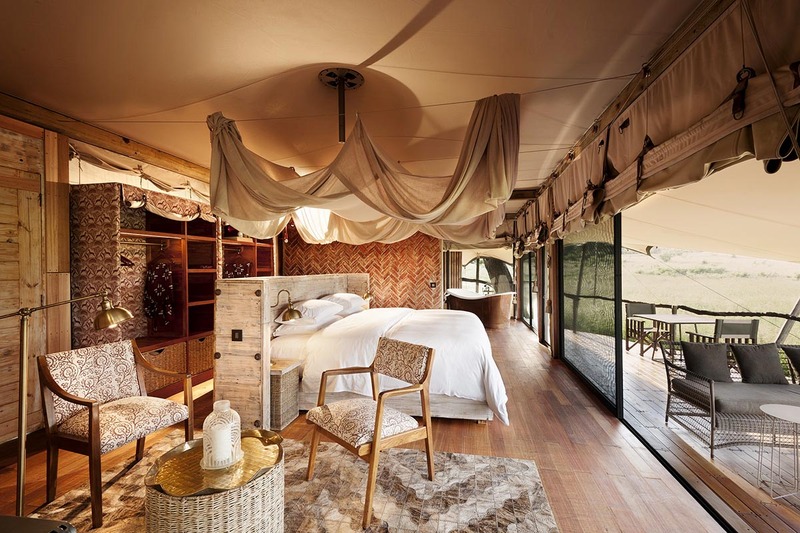 At each of the luxury lodges on our itinerary, we had our own family accommodation so our more raucous pillow fights and animal impressions wouldn’t disturb any of the other guests. As adults, we enjoyed the chance to share a sundowner with some of our fellow travellers, and babysitting services and the option of in-room, earlier dinners meant that our kids didn’t have to wait up to eat. Meanwhile, we could occasionally join the other guests around the main table – or steal a couple of candlelit hours all to ourselves. 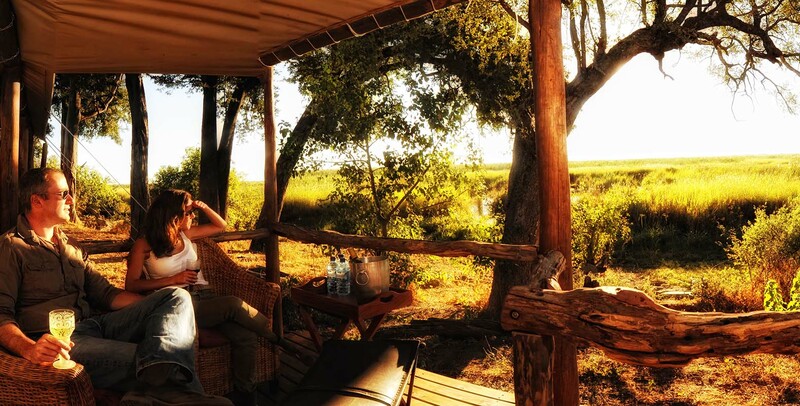 Having booked private vehicles let us adjust the standard lodge hours – a bonus you’ll appreciate if you’ve ever had to introduce a pre-teen to the pre-dawn. 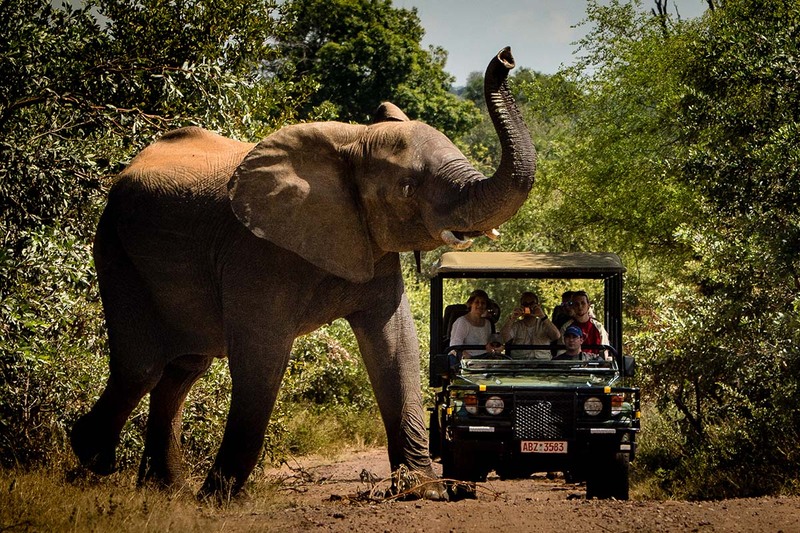 We’d planned on shorter game drives, but each of our guides did such a good job of mixing entertainment and education that the hours simply flew by and the dreaded ‘are we there yet?’ was never uttered. 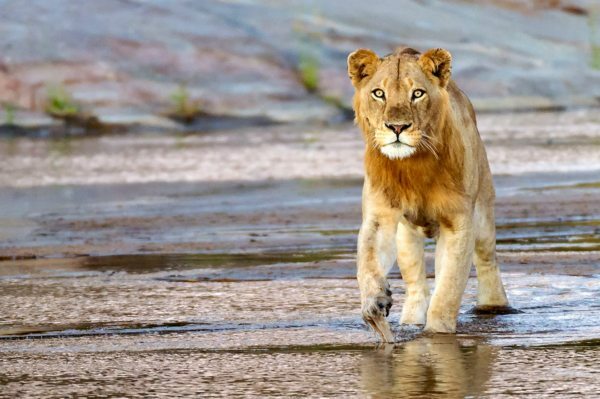 Exploring pristine African landscapes with no signs of human life only added to the sense that this luxury safari in Botswana and Zimbabwe was all about us. Delightful as the lodges were, we came to realise that the true luxury in this trip was having the time and space to bond and create shared memories that will last far longer than this week’s high school crush or latest toy fad. You’ll be met as you disembark from your international flight at OR Tambo International Airport in Johannesburg, South Africa, and assisted through customs and immigration. After a scheduled flight to Kasane in Botswana, you’ll take a scheduled light-aircraft flight to Linyanti. 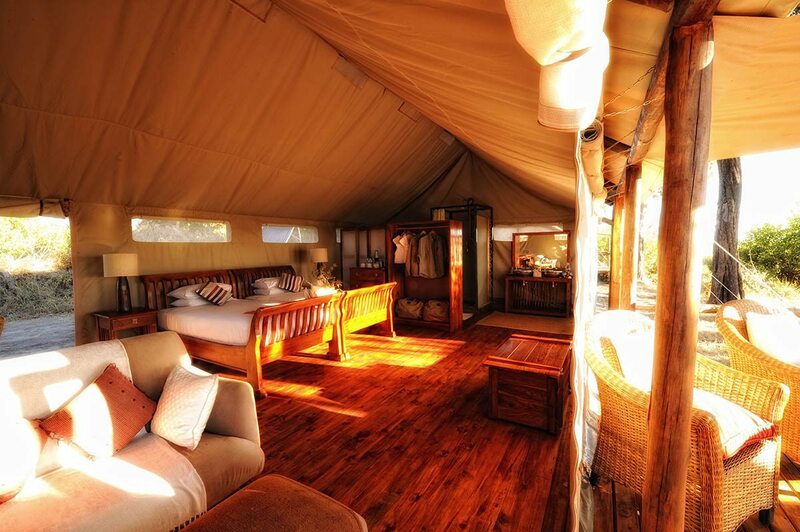 You’ll then take a transfer to Linyanti Ebony, where you’ll spend three nights in a family tent. 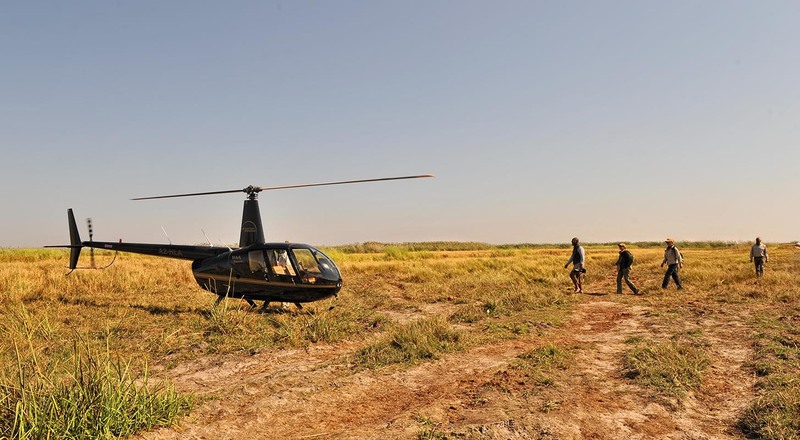 After a transfer from Linyanti Ebony to the airstrip, you’ll take a scheduled light-aircraft flight to Kasane. After a transfer, crossing the border, to Victoria Falls in Zimbabwe, you’ll take a scheduled light-aircraft flight to Hwange. 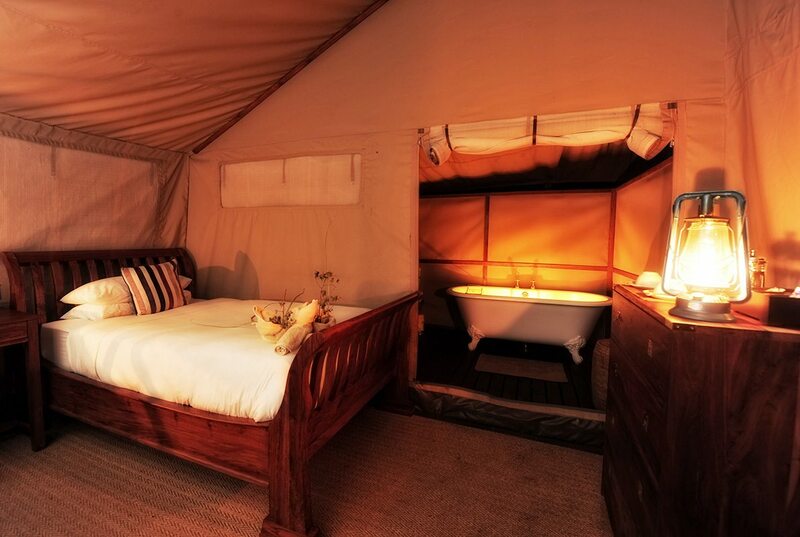 You’ll then take a transfer to Somalisa Acacia, where you’ll spend three nights in a family tent. 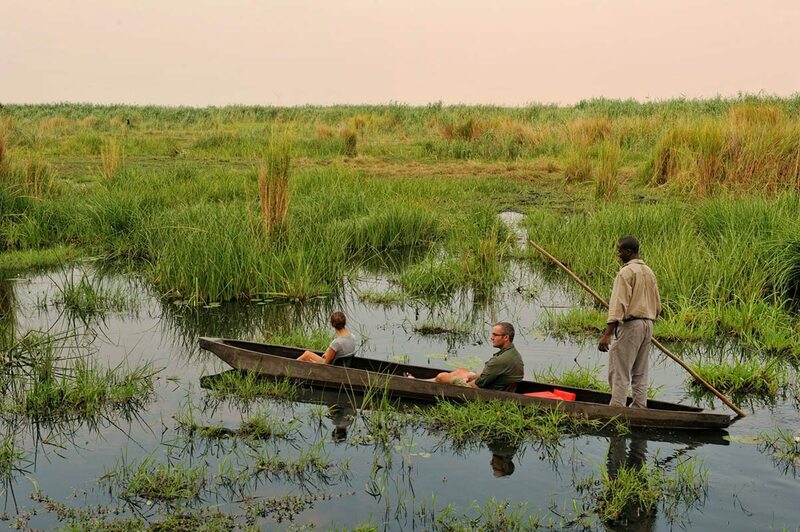 After a transfer from Somalisa Acacia to the airstrip, you’ll take a scheduled light-aircraft flight to Victoria Falls. 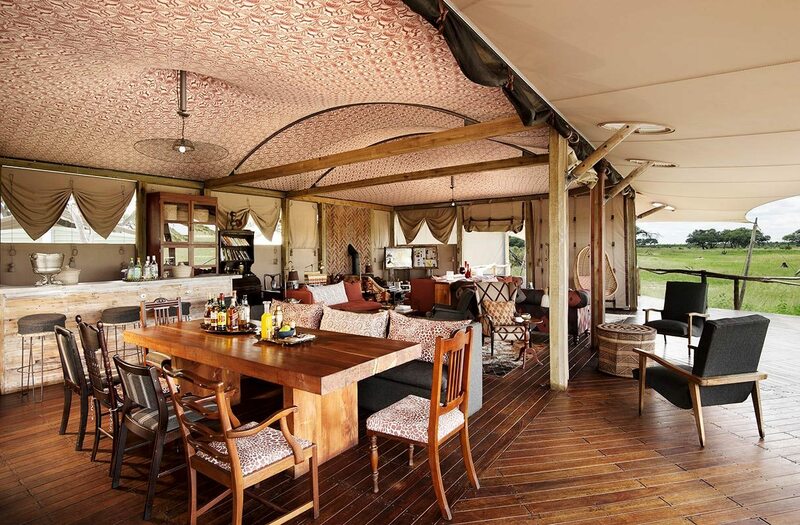 A transfer will then take you to Victoria Falls River Lodge, where you’ll spend three nights in a family suite. 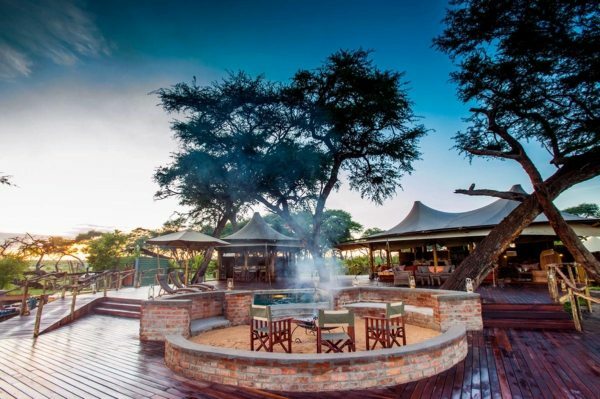 After a transfer from Victoria Falls River Lodge to the airstrip, you’ll take a scheduled flight to OR Tambo International Airport in Johannesburg, South Africa, to connect with your international flight.